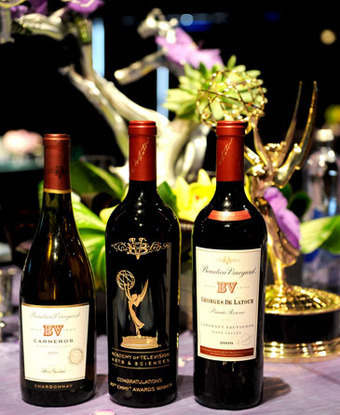 For the 10th year BV will provide the wine for the Emmys. At the Governors Ball dinner they’ll be pouring 2009 BV Georges de Latour Private Reserve Cabernet Sauvignon ($135) and 2011 Beaulieu Vineyard Carneros Chardonnay ($25), as well as a Muscat and a port (all available here). Some limited edition Beaulieu Vineyard wines will also be available at the bar, and all guests get a parting gift of BV Napa Cabernet which is quite nice of them. It’s from Edna Valley, and they describe it as a “big” Pinot – “full-bodied, dark and complex. A bouquet of cassis, cherry, and vanilla excite the nose and the bold flavors of dark berries easily transition to the soft tannins and creamy finish that is sure to please.” 15.2% alcohol – this is all very typical of California Pinots, as opposed to French or even Oregon ones which are far more light bodied and elegant. I haven’t seen all of the nominated shows, but if grapefriend decided who’d win it would be between Mad Men (wine in the 60s) and Game of Thrones (wine in medieval times). But they don’t ask me. So get your Olivia Pope on by grabbing your popcorn and wine and see if the grapefriends prevail! Tags: bv, cabernet, chardonnay, emmys, wine. Bookmark the permalink. Georges de Latour? Not too shabby! Right? Pretty generous of them.